Aston Villa have now been resident at Villa Park for well over 110 years, since 1897 in fact. "Villa Park, Birmingham, home of Aston Villa since 1897 has long been regarded as one of the countrys top grounds and regularly stages FA Cup Semi Finals. The record attendance was set in March 1946 when 76,588 watched a sixth round tie against Derby County. The present capacity is 60,247 with seating for 15,747. Player inset : Ian Ross." I have also found an absolutely stunning piece of old film footage on Google that shows the old Villa Park Stadium as it used to be in the 1970s. 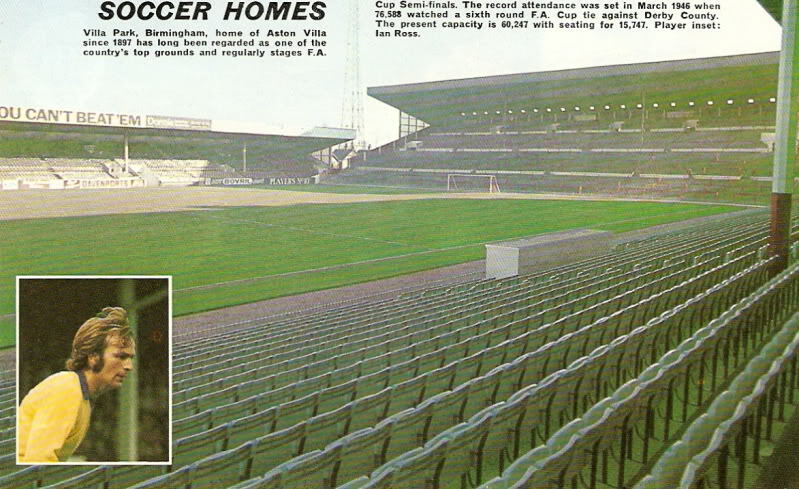 Villa Park as it is now ! !